Innumerable adrenalin-gushing mountaineering activities in Jammu and Kashmir make it an irresistible attraction for intrepid travellers. 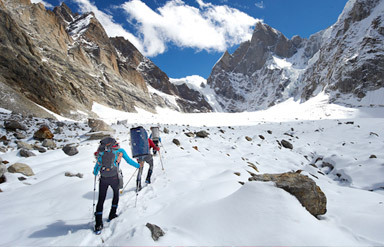 The four main mountaineering locations in Jammu and Kashmir are Ladakh, Kishtwar, Zanskar and Kashmir. The exhilarating mountaineering expeditions can go on for months, with the eventual stimulation of witnessing Tibet or Pakistan from a distant. Few peaks popular for such expeditions are Pinnacle (6930m), Nun (7135m), Sickle Moon (6575m), Crooked Finger (5630m), Kolahoi (5425 m) and others. Usually, the base camps are located in Sonmarg, Pahalgam and Gulmarg. 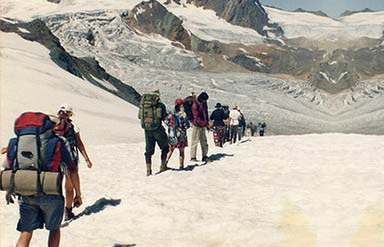 The official permission from the Government of India is mandatory, sanctioned by the Indian Mountaineering Foundation. Adequate rescue coverage is provided with every expedition. Following the local shepherd trails, trekking in Kashmir lets you explore the valley, its scenic vistas, vast meadows as well as Mughal gardens. One can also engage in trudging through high-altitude passes that includes breathtakingly beautiful and turquoise lakes, brick-houses along with vast spaces of meadows. Porters, guides and ponies are easily available for trekking adventures in Kashmir. Have an ethnic taste of Himalaya with the short trek from Srinagar to Lidderwat campsite. Longer treks involving more than a week of expedition include from Aru to Kolahoi glacier along with Sonmarg to Kishensar Trek. Gulmarg is one of the topmost skiing destinations in Jammu and Kashmir. In fact, the Ski lift in Gulmarg dates back to 1989 is one of the highest ski lifts in the world. Locally called as ‘Gulmarg Gondola’, it is still flaunted as one of the masterpieces of French engineering. Long run, deep powder and off-piste skiing and snow-boarding are one of the main tourist attractions of Kashmir, especially during winters. One can also indulge in spectacular ‘curry’ powder Heli-skiing tours in Kashmir. Thus, for those looking out for bespoke adventures in Kashmir, nothing beats this larger-than-life rendezvous, where you can spot the best skiing resorts of Himalaya. 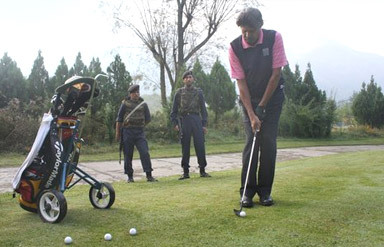 These days, the golf courses in Kashmir include hutments where tourists can even ensure their stay. Additionally, the club buildings reflect the old-age Kashmiri style of architecture. So, get ready for a thrilling adventure and roller coaster ride in Jammu and Kashmir this season. 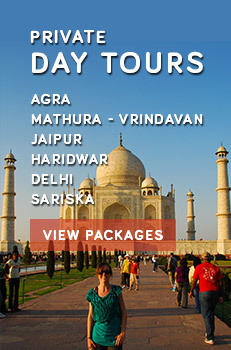 Choose your personalised adventure packages in Jammu and Kashmir at irresistible deals.